After a road and ferry journey which took her across Europe, Trix the T. rex has arrived in Scotland. It takes five days for experts to painstakingly unpack and assemble the massive dinosaur skeleton, which weighs a colossal 5,000 kg, the same as four Mini Cooper cars. And organisers gave access to the dinosaur build on Friday 12 April 2019 for an exciting preview of the T. rex skeleton. With her ferocious teeth and short arms, the Tyrannosaurus rex is probably the most well-known dinosaur in the world. The 39ft long skeleton is an incredibly rare and important fossil. 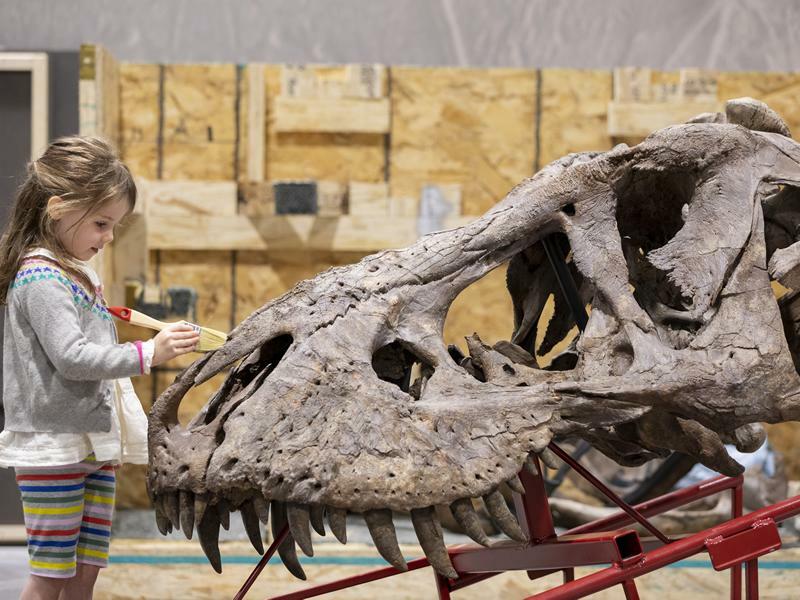 At Kelvin Hall it forms the centrepiece of T. rex in Town, a major interactive exhibition that will engage and educate visitors on the history of this iconic and ferocious dinosaur species. The public can also marvel at a painted reconstruction of what the 66-million-year-old T. rex looked like. Visitors might be surprised to see that the most scientifically accurate depiction of the ancient animal shows it had feathers. Trix’s arrival at Kelvin Hall positions the west end of Glasgow as the dinosaur capital of Scotland! T. rex in Town overlaps with the final weeks of Dippy on Tour from the Natural History Museum at Kelvingrove Art Gallery and Museum, just across the road from Kelvin Hall. Steph Scholten, Director of The Hunterian, said: “We are delighted to welcome Trix the T. rex to Scotland. She has travelled across Europe by road, sailed across the English Channel by ferry and has cleared border control, despite Brexit, to arrive safely with us in Glasgow. “Bringing this major touring exhibition to the city will allow thousands of Scots, and visitors to Scotland, to see one of the world’s most iconic dinosaur species. “Tyrannosaurus rex skeletons are very rare finds and Trix is the only real touring T. rex fossil in the world. This is a major coup for Glasgow which is the only UK stop on her European tour. Chair of Glasgow Life, Councillor David McDonald, said: “Trix has arrived. The anticipation is growing. Like thousands of other visitors, I am really excited to see this impressive, if slightly scary, creature take shape before my eyes. It’s incredible to watch the skilled team from Naturalis in the Netherlands bring this extremely rare real dinosaur skeleton to life in Glasgow. “We look forward to welcoming many dinosaur fans to Kelvin Hall over the coming months, where Glaswegians and visitors to the city can enjoy this unique opportunity to stare into the eyes of one of the most terrifying predators ever to have stalked the earth. Trix will be safely housed in a new, bespoke, climate-controlled, 600m2 pavilion within the massive vaults of Kelvin Hall. The T.rex in Town exhibition has been touring European cities while she waits for a new museum building to be completed at Naturalis Biodiversity Centre in her home city of Leiden, in the Netherlands. Once her visit to Glasgow is finished it is unlikely she will go on tour again. Edwin van Huis, Director of Naturalis Biodiversity Centre, said: “We are thrilled that Trix is in Glasgow and we are very excited to show her off to Scottish and UK audiences. This marks the final stop of Trix on her European tour before she returns to the Netherlands. “Trix is one of three of the most complete Tyrannosaurus rex skeletons in the world, with nearly 80% of her bones intact. She is mounted in such a way that she is bent over with her neck low to the ground, her massive jaws stretched wide in her 1.5-metre skull, staring straight into the visitor’s face. It is a magnificent sight. “The skeleton is the central part of an interactive and educational exhibition which also includes reconstructed examples of Trix's favourite prey along with the habitat and how she was discovered in Montana, USA. Trix is a unique find. With almost 80 percent of bone volume found, she ranks in the top three T. rex skeletons in the world. Trix is a five-tonne, 39ft (12 metres) long female T. rex whose extremely well-preserved skeleton was discovered in Montana, USA in 2013. She will be on display at Kelvin Hall from Thursday 18 April to 31 July 2019. The T. rex in Town exhibition is organised by The Hunterian at the University of Glasgow and Glasgow Museums and has been supplied by Naturalis Biodiversity Centre. Tickets for the major dinosaur attraction and interactive exhibition are available now https://kelvinhall.org.uk/trex/, Tickets £14 / £8, family ticket £39.50. Concessions are also available.